Hotel manager asked me not to visit Dhauli alone. It might be too expensive (almost 600 bucks) for a solo traveller as there was no bus service even no shared auto rickshaw service is there. People either go via car or reserved auto rickshaw. 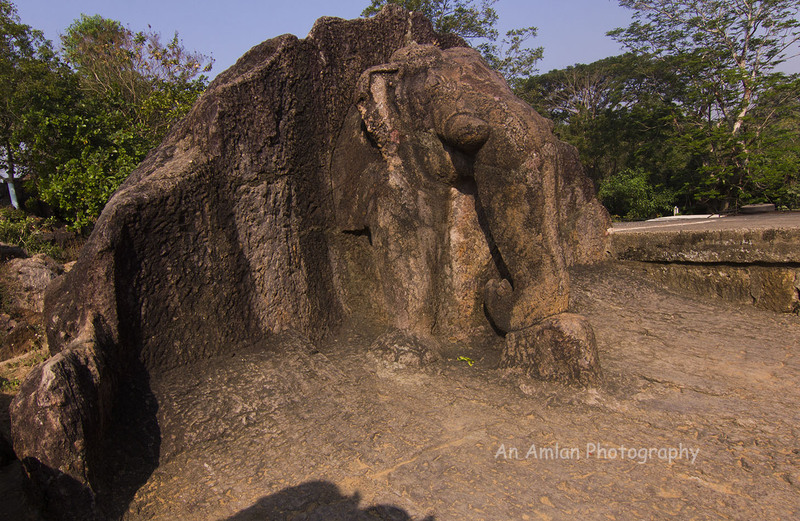 In my previous post I told you the story of my solo trip to Bhubaneswar. I had ample time after visiting the Rajarani Temple and thus decided to visit Dhauli. It was almost 9.30 am of a winter morning. I had a confidence that the entire day was in my hand, so by hook or crook I could visit Dhauli. I opened GPRS. 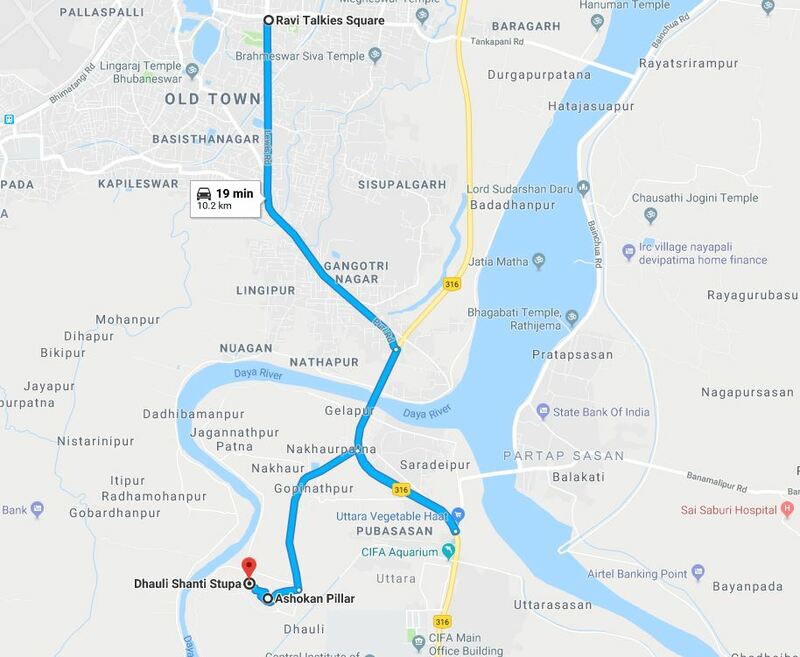 Google Map showed me the distance of Dhauli is not more than 9.9 kilometres from Rajarani Temple. I have a practice of walking, more over I trek in Himalayas. 9.9 kilometres in plain land is nothing to me. To be very honest, the discouragement of the hotel manager whetted my desire to visit Dhauli with myself only. I had breakfast with local snacks and obviously “Chhena Poro” (the famous Oriya sweets) played the role of desert, filled the bottle with lime water. “Kothi jibo?” A sudden question attracted me towards my back. It was an auto rickshaw puller who asked about my destination. “Puri Highway Crossing” I replied. He got agree with 10 bucks. He took me in his auto and started towards the highway. I knew Oriya a bit so tried to interact with him. He was going to Dhauli Temple to take his wife who went there to pray for their only child’s board exam. I requested him to drop me at Dhauli Ashokan Pillar. At the beginning he was a bit sceptical but at the end he asked for 50 bucks. I was okay with the amount and he took me to my destination. Mouyan King Ashoka the Great was war monger at his early days. He conquered Kalinga (ancient name of Orissa) in 257 B.C. The death and destruction of Kalinga War impelled him very much. Repentant King decided to leave Hinduism and got attracted to Goutama Buddha who taught the lesson of peace and love. After getting converted to Buddhism he constructed a stone inscription and covered the inscription with a statue of elephant. 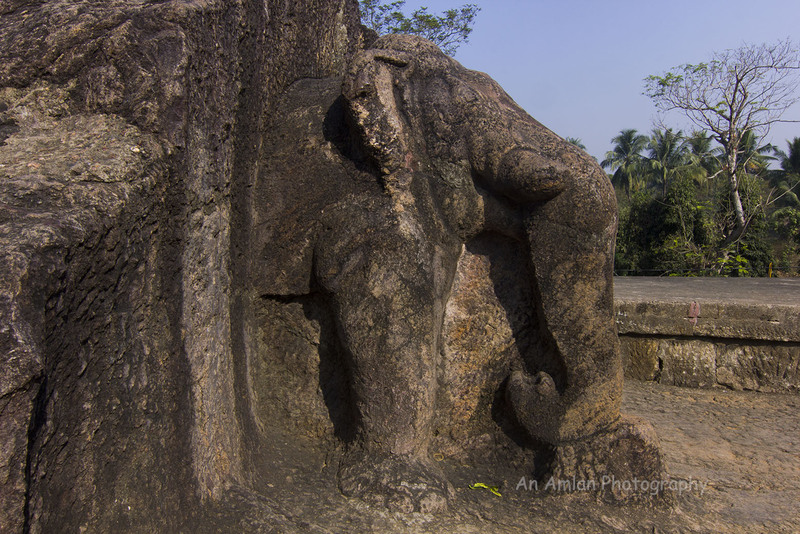 Accroding to Buddhism, elephant symbolises prophet Tathagata. Tathagata (Goutama Buddha) turned himself into a white elephant before going inside the womb of mother nature. The area is now inside an amusement park. Considering this stone inscription as one of the oldest one, Archaeological Survey of India maintains it. The original inscription is covered by glass. When I started to take a snap of the stone a Buddhist monk forbid me. I had no issue in this. So, I took the staircase beside to the glass room and went to the statue of the elephant. Though the stone inscription was constructed by sandstone but the one metered high statue of the elephant was built on local “Swayambhu Stone”. Thus, unlike to other Mouryan architectures this monument is not so much polished. But the statue is so lively that the wisdom and credibility of the sculptor can be understood. Dhauli is the grandfather of Kalinga Art. Or in other words Dhauli was the ceremonial beging of Kalinga Art. My next destination was to go to the peace pagoda. It was just 300 meters far from the Ashokan Monument but this time I had to trek to the top of Dhaulagiri Hill. I had no issue to trek but suddenly a police van was coming on that way. I asked for lift. The old police man agreed and he took me to the peace pagoda. On the top of Dhaulagiri Hill, a Viswa Shanti Stupa (World Peace Pagoda) was jointly built by the Japan Buddha Sangh and the Kalinga Nippon Buddha Sangh in 1972. Like other peace pagoda, Dhaula Giri Shanti Stupa has the same structure. 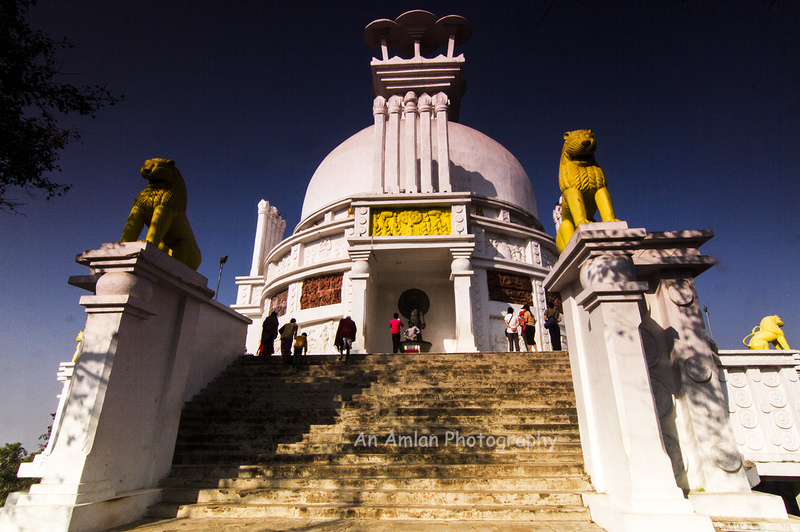 The stupa contains the statues of prophet Tathagata in all four postures. I loved the place so much that I spent ample time there. I just forgot that I had no personal or hired vehicle and it was about 10.2 kilometres away from the main city. I started coming back. After about 100 meters I got the noise of a car. It was a matador filled by Straw. I asked whether he could drop me to Bhubaneswar. Fortunately, the matador driver was going to Bhubaneswar and he allowed me to seat beside to him. I was asking her the fare that he wanted to charge. He did not agree to take anything from me. When I got down at Ravi Talkies, I offered him chocolate and cigarette. Initially he was reluctant to take them but finally he took to chocolates for his daughter and smoked the cigarette with me.